We were called asked about our tumbled travertine restoration service because our client had a number of problems with their floor in Rhyl, Denbighshire. They were particularly interested in the cost and the work involved so they could budget for the work. After a quick chat, we agreed that there were two particular problems they were looking to solve. First: As with many tumbled travertine floors, the holes and crevices had filled with dirt, making the floor look dirty and difficult to keep clean. 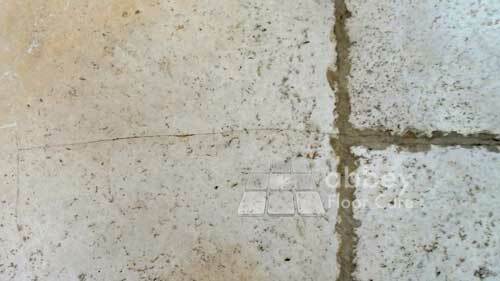 Second: The floor had suffered from severe settling, causing many long cracks throughout the floor. Over time the cracks had filled with dirt, leaving long black lines throughout the floor. The homeowner had done their best to look after their tumbled travertine floor, cleaning it regularly and re-sealing it a few times. But they had become increasingly frustrated that all their good work did not last very long so searched for tumbled travertine restoration specialists. The floor was originally sealed with an impregnating sealer. However as the surface had worn, the sealer could not prevent soil locking into the floor. Given the amount of traffic on the floor, we recommended using a hard wearing surface sealer. This kind of sealer will protect the surface of the stone and act as a sacrificial wear layer, that can be topped up when it shows signs of wear. 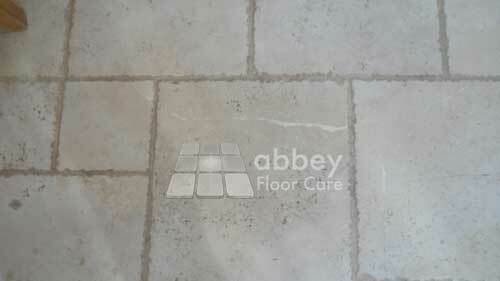 We proposed to deep clean the floor, fill the problem cracks and apply a high quality long-lasting surface sealer. On our first visit, we cleaned and sealed a sample area. We also filled with an epoxy grout filler. The filler did a great job. However, it was a lighter colour than the sealed stone. Unfortunately, we could not source a better colour match, as the grout is only readily available in one colour. On the first day we installed protection to the surrounding walls, adjoining wood floor and bespoke hand painted kitchen furniture. 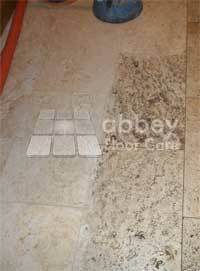 The tiles are slightly uneven, and in this situation any brushing process will cause splashes. While we always take extreme care to minimise any splashing, better safe than sorry. This process took just over two hours. When the job was finished, it took only minutes to remove the protection! The remainder of the day was spent deep cleaning the floor with a heavy duty cleaning chemical, agitated into the stone with a rotary scrubbing machine. We removed the slurry with our “clean and capture” equipment. This is our “secret weapon” for tumbled travertine restoration work. Hot water is sprayed under pressure into the surface of the stone. The pressurised water swirls in the holes and over the stone to lift out ingrained soil. The slurry is immediately vacuumed away into the recovery tank in our truck. The pressure rinse had the added advantage of cleaning out the cracks and carrying away any loose stone from the cracks, leaving them ready for filling. The floor was left overnight to dry. On the second day, we filled the cracks with a Jasmine epoxy grout filler. This work took around 4 hours to complete as the cleaning revealed additional cracks! 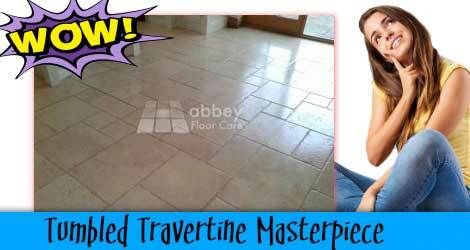 Tumbled travertie is characterised by the natural holes and voids in the surface. 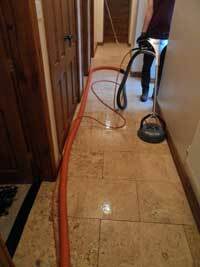 The holes and voids will fill with soil that becomes difficult to remove with normal cleaning. Because of this, we applied a heavy duty industrial sealer that is resistant to harsh chemicals and abrasionWe sealed the floor with three coats of synthetic acrylic floor sealer. This kind of sealer is extremely hard wearing, ideal for this situation. Because of this, we applied a heavy duty industrial sealer that is resistant to harsh chemicals and abrasion. So the floor can be scrubbed without removing the protective seal. We sealed the floor with three thick coats of the floor sealer, giving an attractive, hard-wearing mid-sheen finish. 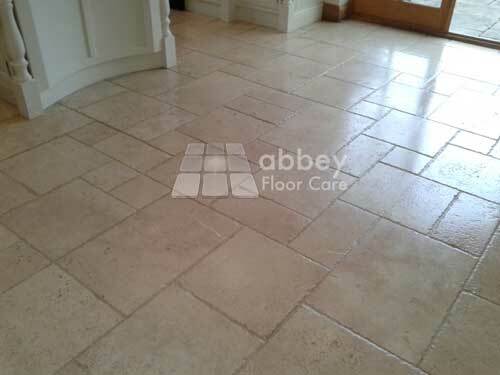 The homeowner was delighted with the finish saying that the floor had never looked this good. 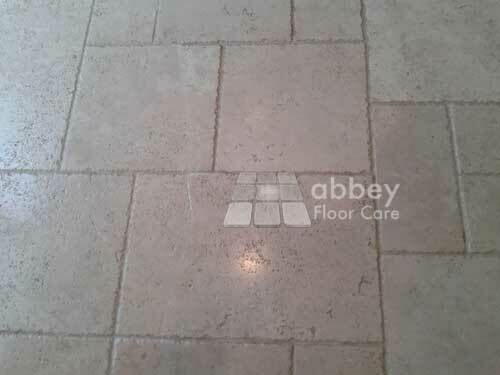 If your floor needs some tlc, please contact us about our travertine restoration services.